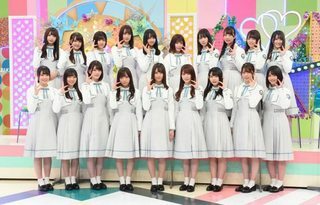 Discussion in 'Keyakizaka46 News & Releases' started by Crossheart, Mar 19, 2018. I guessed that much. I found out that Hinata will be in 4 prefectures vs Nogi with 12. So it seems like a pretty good step forward. yeah it's a great move, i can only see this show gaining popularity and they should be able to build on the momentum of a solid first season. @plus1plus1 -- The three new stations are all in small places, so I don't think they will add that much, but it's a start. I too would be grateful if someone who really knows about this stuff would bring us more info. @ruggermcphee -- Your idea of BDs (a) sounds great and (b) seems likely, to me. The three new stations are all in small places, so I don't think they will add that much, but it's a start. I too would be grateful if someone who really knows about this stuff would bring us more info. They do not broadcast there simultaneously either so there's that. But these are the slots NGT had before they lost all their sponsors. And they had impressive ratings here. 7-8% they said on their twitter. Which is apparently good. I also wish someone who knew what they were talking about would help push us in the right direction. I like the show's new name, but one thing has struck me from the start: the name reminds me of the name of the weekly Pokemon TV show Pokemon no uchi atsumaru? ポケモンの家あつまる？ ("Shall we meet at Pokemon's house?") "Let's get together at Hinatazaka" is at least similar. Not a problem, more likely a plus, lol. Is this kind of expression a common name for shows? It's not similar at all atsumaru has a double meaning because Pokémon is all about collecting them, which would be normally atsumeru (same verb but transitive version). A better translation of the title, which preserves the double meaning, would be ‘Shall we gather at the Pokemon house?’. But even disregarding that, to atsumaru or gather somewhere has a different nuance than to meet somewhere. Let's gather at the Pokemon house imply (not necessarily but implies) an intention to stay there. Let's meet at Hinata Hill implies that's a starting point, we'll meet there and then possibly go elsewhere. The meeting place is more like just a reference. As for the reason, like both Nogi shows (Nogidoko and Nogichuu), it makes reference to Hinatazaka being the name of an acutal place (even though it kind of isn't because the reading is different). It's not similar at all atsumaru has a double meaning because Pokémon is all about collecting them, which would be normally atsumeru (same verb but transitive version). A better translation of the title, which preserves the double meaning, would be ‘Shall we gather at the Pokemon house?’. But even disregarding that, to atsumaru or gather somewhere has a different nuance than to meet somewhere. Let's gather at the Pokemon house imply (not necessarily but implies) an intention to stay there. Let's meet at Hinata Hill implies that's a starting point, we'll meet there and then possibly go elsewhere. The meeting place is more like just a reference. As for the reason, like both Nogi shows (Nogidoko and Nogichuu), it makes reference to Hinatazaka being the name of an acutal place (even though it kind of isn't because the reading is different). Thanks for the info. Very useful. But after your explanation, I think "not similar at all" may be an exaggeration. Definitely not the same, definitely different nuances, but with some basic similarity: place -- come together. That's probably what I meant. In English if one show is titled ‘Let's meet at Foo’ and another ‘Party at Bar's’ we wouldn't call them similar even though there is a common theme. This week episode was good. 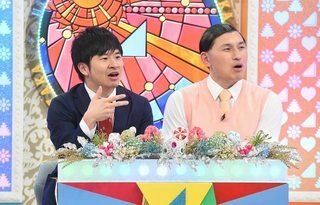 Maybe it is just me, but the members seems very bright on this episode. There were many interesting moments in this episode. These are what I can remember. - members' plan to boycott the show. - their fake reaction to 2nd gen audition announcement. - first performance as the "Entertainment Group" at Keya 1st anniv concert. - Tomita's Chuuei monomane. It could become a routine. - Kosakana name copyright case. - The 0 guest HS event. I need to rewatch this episode several times until I remember all the dialogues in it. And, can't wait for the next episode. The fight to get the KAWADA-san ownership. Can be presented to showcase netizen who said "It's all thanks to Keya fans that....", how on the spot he/she is. Even I feel ashamed having those thanks. And yeah, I replayed that Tomita monomane. The apologizing part, of course. 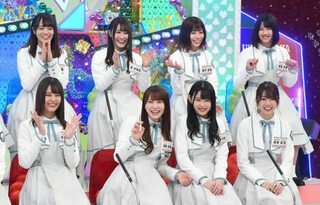 I would never know there is suppose the 10th member if I'm not notice there is 1 girl got censored when introducing 2nd gen of hiragana. From zero guest to full-booked Budoukan. What a great journey. I'm glad that all member have a chance to talk and share their opinions in these two episode about Hinatazaka's history, even higashimura mei. But sadly there was no hiyotan there. I love the atmosphere of studio, when one person talk, there's also many persons who react or just laugh at it. There's mutual feeling between mc and hinatas, for both of them enjoying the recording process and make the program more interesting. I have to give an applause to the Hinatazaka girls for being very courageous as of late. From watching the development of the show I must say they love taking risks and I mean a lot of risks. It is a very appealing trait to me but with their way of taking risks with Audrey in this show, it shows their courage of which I admire them for in taking that interest to further develop their feelings as a whole/group. By doing this I think Audrey wants to reciprocate this same feeling they receive from Hinatazaka to them and vice versa. This is just what I know and feel from the show but from watching this weeks episode I think you can understand more of where I'm coming from. Kasuga has announced his marriage to the woman (they are both 40) he has been after and to whom he announced his engagement a few weeks ago. The one named "Kumi" who works in a dog cafe. The one a tabloid "revealed" he had been dating long after people knew about it. Anyway, the deed is done. I am very happy for him...and for her. She must be someone special to commit herself to the big guy. @Zaebore -- Thanks for pointing out how courageous these members are. I think even greater risks are coming with Koyabu-san on Bingo. But I also wouldn't be surprised if Audrey tried to better whatever he does on the other show. What a pair of hosts! Hinata are being very well treated -- and they have what it takes to live up to the benefits they are being given and make the most of them. Congratulation Kasuga! The HinaAi staff can use it as segment material. They have been together for 3 years. So, I think that is what make them have such a great teamwork. You also can see it on Hiragana Oshi when they did Konoka's sport segment. They gave a chance to MeiMei and Kawada that don't talk too much, a mic performance. Then, they also let Hiyotan decided how much point the winner team take from the loser team. Without this part, I believe it is hard to notice Hiyotan in those 2 episodes. 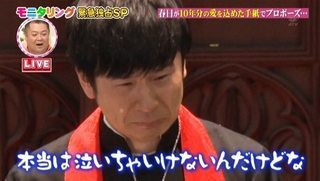 There are now pictures of a special "proposal" ceremony at which Waka-chan wept, and where you can see the lady. on-screen titles: 1. An atmosphere of happiness surrounded the two. 2. "Please marry me." 3. "Yes, gladly!" 4. "I just shouldn't cry, but..."
Just to not do more "out" spam, let me share the "proposal segment". 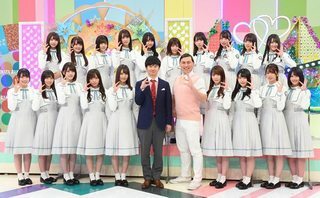 I can't wait to see the group reaction and it would be great if they record a kind of SP program with Kasuga-san. All the credit to the uploader.